Medium: original woodcut. The inscription on the banner translates to "Come Sweet Death". Signed in pencil by Richard Seewald and printed in Germany in 1922 for the very rare "Die zweite Ganymed-Mappe" portfolio of "Das vierte Jahrbuch der Marees Gesellschaft", published in Munich by Marees-Gesellschaft, R. Piper & Co. This impression is one of the deluxe signed edition of 300 printed on laid paper. The image measures 5 1/2 x 7 inches (140 x 175 mm); a fine impression with full original margins. Medium: original color woodcut. Catalogue reference JH 771. Published in 1919 for Genius. Image size: 9 1/2 x 7 inches (240 x 178mm), on wove paper with full margins. This print is from GENIUS: Zeitschrift fur Werdende und Alte Kunst, a deluxe art revue founded in 1919 in the aftermath of The First World War. 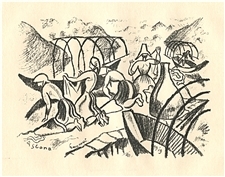 Europe was devastated by the War, both physically and psychologically, and Expressionist art was attempting to create a new artistic idiom, and Richard Seewald was an important member of this movement. This is a good impression from the first (and rarest) year of Genius. Not signed. Medium: original woodcut. The inscription on the banner translates to "Come Sweet Death". Printed in Germany in 1922 for the rare Ganymed portfolio of "Das vierte Jahrbuch der Marees Gesellschaft", published in Munich by Marees-Gesellschaft, R. Piper & Co. This impression is from the unsigned edition printed on laid paper. The image measures 5 1/2 x 7 inches (140 x 175 mm); a fine impression with full original margins. Not signed. Medium: original lithograph. Catalogue reference: Jentsch 91. This lithograph was printed in Germany in 1919 for Das Kestnerbuch, one of the most important collections of original prints published during the height of the German Expressionist movement. This impression is printed on wove paper. The image measures 5 1/2 x 7 1/4 inches (135 x 185mm); the total sheet measures 8 1/2 x 11 inches (220 x 280mm) with full original margins. Signed in the plate (not by hand). Medium: original woodcut. This is a richly inked, dark impression on wove paper issued in 1920 in an edition of 500 for Deutsche Graphiker der Gegenwart (German Printmakers of Today) published by Kurt Pfister in Leipzig, Germany. The image measures 6 1/8 x 8 1/4 inches (158 x 210 mm) with full original margins. Not signed.